Online shopping platform MyOrder is to conduct an NFC mobile marketing pilot with 25 retailers in the Dutch city of Leiden. During the three month trial, shoppers will be encouraged to tap in-store NFC touchpoints that open the MyOrder app automatically — and receive a €0.50 credit to their MyOrder account in return. Consumers will also be able to browse exclusive location-based coupons which are then redeemable through the app’s shopping portal. 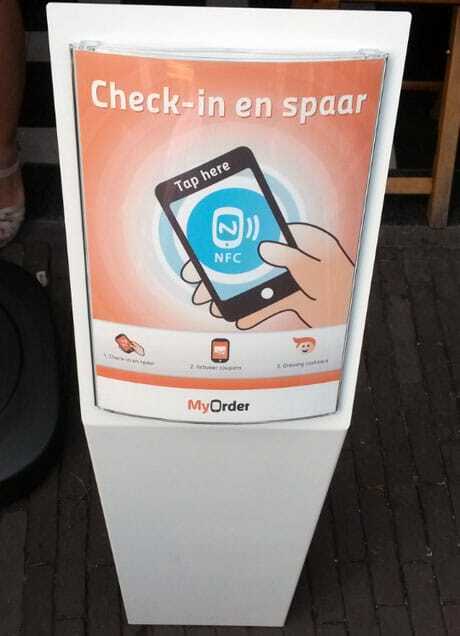 MyOrder, which is majority owned by Rabobank — one of the Dutch banks behind the mobile payments pilot in Leiden — will further promote the scheme through NFC stickers provided by marketing platform provider NFC Support. These link the user to the MyOrder Cashback Facebook page and offers them five credits for liking the page. “The NFC payment pilot in Leiden is an ideal playground to promote NFC products,” says NFC Support founder and CEO Tristan de Haas.